Last summer was the best family camping trip that we have ever been on because we were not tied to a rigid schedule. We spent most of the time wild berry picking of sorts. blackberries, huckleberries, blue berries, and cherries through Oregon. Some days we drove only 30 miles because we discovered something like a cute town that we wanted to explore. Having a schedule is great because you will not be driving aimlessly with no destination. On the other hand, you may enjoy your car camping trip more if you loosen up your itinerary and be adventurous. Oregon is filled with wild berry picking starting in August and running into the end of September. On one camping trip to the Hood River region in Oregon, we picked blue berries, huckleberries, salmon berries, blackberries, raspberries, as well as local peaches and nectarines. Most of these tasty berries were found on the way to Lost Lake Campground. If you are in search of the ultimate huckleberry picking region, I suggest a camping trip to Lost Lake campground in August. The ground is covered with wild huckleberry plants throughout the campground and surrounding forest. The drive to Lost Lake from the Hood River valley is long and winding. However, it’s worth the drive. We noticed young ladies picking berries from green bushes. Wild huckleberries bushes grew everywhere in the campground. To paint a picture of thick the blue berry bushes were, imagine a beautiful forest carpeted with lovely ferns. Lost Lake is home to the rare salmon berries which look like yellow version of blackberries. If you really want to deviate from a traditional camping trip, consider the 35 mile Fruit Loop in Hood River County. First of all, the road is almost empty of cars because this scenic route is off the beaten path. You can sample and buy fresh seasonal produce like blue berries, cherries, peaches, and pears. Did I miss anything? One of the farmers let us visit his live stock after we finished picking cherries. Beautiful views of Mount Hood are present from just about every vantage point. You can view about a half dozen snow covered peaks including Mount Rainier. You might be wondering what we did with all the berries that we picked. We ate them. We mixed them with yogurt and home and home made granola in the morning. In the evening my wife made chia seed pudding and mixed the wild berries in with the chia seed pudding. After all the berry and fruit picking near Mount Hood and the Hood River, we were looking for a different venue for excitement. We had less than a week of our camping trip left and it was time to slowly make our way home. I looked on the map and noticed the small town of Durfur, Oregon. 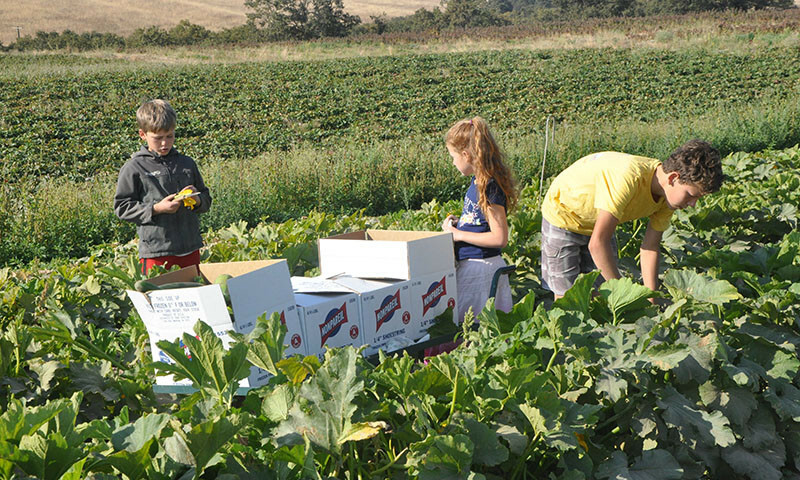 After Picking Wildberries, Why Not Visit A Local Family Farm? We drove by Azure Standard Farm in hopes of seeing free range cattle, chickens, orchards filled with ripe fruit. Secretly, we thought that we may even get a short tour. I located the farm on our GPS and drove to drive way. An old sign posted the hours of operation. The place is beautiful. A grand old farm house dominates the landscape. A large trampoline in the front yard provided a clear signal that children live here. Turns out that the matriarch, Mrs. Stelzer, bounced daily on the trampoline and she is in her 80’s! We took a few pictures of our family in front of the Azure Standard sign and left for Dufur after failing to locate Mr. Stelzer. It’s a good thing that my wife is persistent. She still wanted a tour. We visited the office in Dufur and were told and gave David Stelzer a call. I mentioned to my wife that most successful CEO return phone calls if you leave them a personal message explaining the reasons for the phone. David Stelzer called us back shortly and invited us on a tour. Azure farm is amazing! We met several of the Stelzer family as they explained their operation to us. We sampled fresh cherries at the packaging and processing area. The coolest part of the visit was a tour of their green house. Azure heats the green house with with wood from the property. They recycle exhaust from the wood burning furnace and burn it again. Tomatoes, cucumbers, and even papayas growing inside the green house. Besides eating the berries fresh with every meal, my wife made steamed gluten free berry cakes in our wok. The same day that we checked out of our Yurt at Tugman State Park, we found a huge wild black berry patch on a remote back road on the way to pick organic blue berries at a u-pick farm. We were only going to pick a few pounds since we going to pick blue berries. We must have picked 10 pounds of berries! The berry patch was so thick. It was far enough away from the road so we did not have to be concerned about pesticides. Our family loves eating. I think we spend more time eating than any other activity. Because our diet consists of fresh fruits, we don’t put on extra weight. We were enjoying the local scenery so much that we stayed in the quaint town of Brownsville in a spacious city park for $10 a night. We were one of two campers in the entire park. Most people never think of camping in a city park. We like them because they are quiet and close to everything that we need-like food and showers. My kids loved the place because there is a play ground with other kids running around. The park also includes several patches of wild black berries that were ripe and ready to pick. We stayed for one night before leaving for the Hood River area in search of cherries and peaches to eat.